The 2016 DP World Tour Championship golf tournament in the Final Series on the European Tour is taking place this week from November 17-20, 2016, on the Earth course at the Jumeirah Golf Estates located in Dubai, United Arab Emirates. Here is a list of the prize money up for grabs for the European Tour golfers at the 2016 DP World Tour Championship. The 2016 DP World Tour Championship is the last of the three Final Series golf tournaments on the European Tour in 2016. Only the top 60 players in the European Tour's Race to Dubai rankings can play in the 2016 DP World Tour Championship. In addition to the prize money listed below the top 10 players in the final Race to Dubai rankings will also earn bonus money which you can see here. 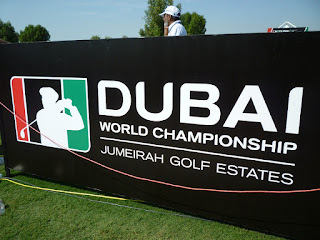 The DP World Tour Championship dates back to 2009. Rory McIlroy (2012, 2015) and Henrik Stenson (2013, 2014) jointly hold the record for most wins with two each. The other three winners are Lee Westwood (2009), Robert Karlsson (2010) and Alvaro Quiros (2011). Total prize money up for grabs at the 2016 DP World Tour Championship is $8 million. All 60 players will earn money in the 2016 DP World Tour Championship if they complete the tournament with the 60th player earning at least $22,400. The winner of the 2016 DP World Tour Championship will earn a cool $1.333 million. As mentioned above, the winner of this tournament last year was Rory McIlroy. The winner will also get bonus prize money season long Race to Dubai bonus pool. Second place is worth $888,900 at the 2016 DP World Tour Championship. Andy Sulliva from England finished alone in second place here last year. Third place at the 2016 DP World Tour Championship is worth $520,000. Branden Grace from South Africa finished alone in 3rd place here last year. Fourth placed is worth $400,000 at the 2016 DP World Tour Championship. Danny Willett, Francesco Molinari, Charl Schwartzel, Matthew Fitzpatrick, Emiliano Grillo and Byeong Hun An all tied for 4th place in this tournament last year. Fifth place is worth $320,000 at the 2016 DP World Tour Championship.